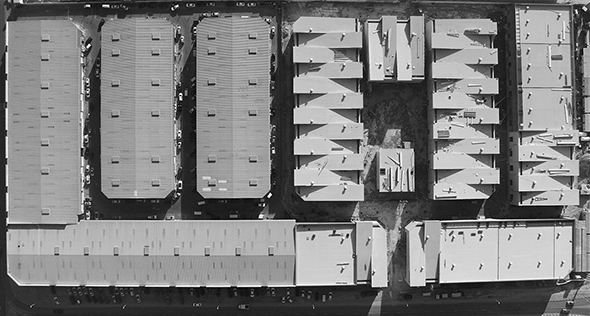 Aerial view of Alserkal Avenue’s new expansion, March 2015. Photo: Mohamed Bin Mayed. Courtesy of Alserkal Avenue. Dubai—Alserkal Avenue is pleased to announce a selection of new creative businesses and organisations that will join the developing art and culture hub in fall 2015. In line with its mission to advance the growth of art and culture in the region by nurturing a diverse and sustainable ecosystem, the Avenue is home to a dynamic, curated community of industry leaders and start-ups. On Monday 16 March, art and culture enthusiasts from around the world gathered in The Yard—an outdoor square in the centre of the newly expanded Avenue—for remarks by Abdelmonem Bin Eisa Alserkal, Founder and patron of the arts. The event included an announcement of newcomers to join Alserkal Avenue’s existing 21 art galleries, cultural organisations and creative businesses and was followed by a first look at the new areas and tours of site-specific art installations which introduce Alserkal Avenue’s new homegrown programme. Contemporary art remains at the heart of the Avenue with the first international galleries to expand to the regional stage; Leila Heller Gallery, New York, will join the Avenue to exhibit an extensive programme of contemporary Western and Middle Eastern artists as well as exceptional works from the 20th century, whilst Stephane Custot Gallery, Dubai, aims to create dialogue between influential modern masters and international contemporary artists between East and West. They will be joined by Paris-initiated Jean-Paul Najar Foundation (a partnership with Alserkal Avenue), which will present European and American Post-Minimal works from the 1960s through the 1990s and host a programme of activities around abstraction. Also opening its doors on the Avenue is MB& F M.A.D. Gallery, Geneva/Taipei, which introduces kinetic art and limited edition design with a focus on horology. Rounding out the contemporary galleries is regional pioneer The Third Line, Dubai, which represents preeminent Middle Eastern contemporary artists including Monir Farmanfarmaian and Farhad Moshiri. In addition to galleries and arts organisations, the Avenue will welcome this fall an increasingly diverse range of creative businesses in design, performance, film, fashion and food. Highlights in the realm of the performing arts include a new community black-box theatre The Junction, and the established community arts space thejamjar. In parallel with the introduction of new creative ventures, Alserkal Avenue will also launch its own not-for-profit programming in support of performance, installation art, public and social practice. In addition to commissioned artworks presented during Art Week and on view until 15 June, upcoming highlights include the launch of an online cultural radio project; a new project space for homegrown programming; and the first live-in artist residency in the UAE designed to encourage experimentation, dialogue and collaboration between residents who will also contribute to an active and ongoing public programme. For descriptions of these newcomers and a full list of art galleries and cultural organisations currently in Alserkal Avenue, including those participating in the evening’s Galleries Night on Monday, 16 March, please visit www.alserkalavenue.ae. T +1 212 202 3402 / concetta [​at​] suttonpr.com.